#Afrobytes is an international tech conference dedicated to African Innovation taking place next June 2017. It’s going to be held at Station F in Paris, the world’s biggest tech campus, which has just announced it will be the base for Facebook’s first business incubator. 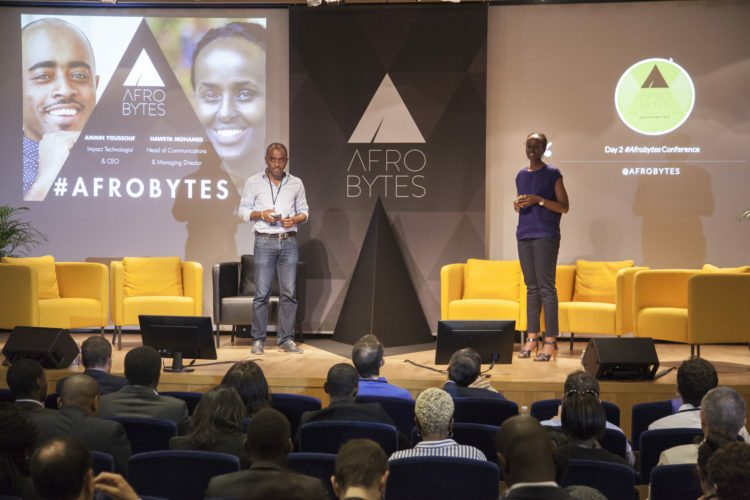 #Afrobytes was founded by Haweya Mohamed and Ammin Youssouf and they held the first #Afrobytes conference last year. Juliet Wanyiri, the founder of Foondi Workshops which runs collaborative design workshops and pictured in the header, spoke last year. Haweya Mohamed and Ammin Youssouf on the stage. Fatoumata was speaker at #Afrobytes 2016 edition and tells us about the leading internet platform, Jumia. She founded Jumia Ivory Coast and managed it for two years before leading AIG’s biggest venture, Jumia Nigeria, as Managing Director, in 2014. Fatoumata Ba is passionate about technology and innovation in Africa as a way of improving lives and is an active member of the MTN Entrepreneurship Challenge Powered by Jumia which promotes and supports tech entrepreneurs across the continent. Maya Horgan Famodu founded Ingressive, a firm guiding global capital to top Africa tech through a 2,000 member angel database and semi-annual Africa investor tours. She organises events around the world to convene major players in African tech and investors who back them. Kibrom Tadesse manages xHub, a tech incubation hub in Addis Ababa established for the purpose of enabling IT entrepreneurs convert their idea into a product or a company and maximise local innovation potential through providing trainings, networking opportunities, synergy, critical tools and physical space. It’s these kind of creative tech entrepreneurs who’ll be networking, speaking and attending the #Afrobytes tech conference – a unique opportunity to meet and share your views with players deeply involved in African business. On June 8 and 9, 2017 in Paris, TRUE Africa will partner with Afrobytes to offer you the opportunity to join a bunch of people who truly believe that the next big digital and human adventure will take place in Africa. Speakers already include Iyinoluwa Aboyeji, who co-founded the Zuckerberg-funded coding school Andela and Clare Jones, head of global partnerships at What3Words, an startup which has developed a three-word address system and is currently working with the Ivory Coast’s national post system. Don’t miss the opportunity to meet the best African tech talent; visit Afrobytes.com to register.